शुष्क मौसम के दौरान एन्जिल जलप्रपात. ↑ अ आ "What is considered a Waterfall?". World Waterfall Database. अभिगमन तिथि 2009-12-02. ↑ Carroll, Rory (2009-12-21). 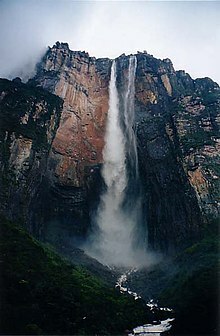 "Hugo Chávez renames Angel Falls". द गार्डियन. London. अभिगमन तिथि 2010-04-25. ↑ "The Lost World: Travel and information on the Gran Sabana, Canaima National Park, Venezuela". अभिगमन तिथि 14 Nov 2009. ↑ "Jimmie Angel … An Explorer". 2008. अभिगमन तिथि 14 Nov 2009. ↑ Robertson, Ruth. "Jungle Journey to the World's Highest Waterfall.". प्रकाशित Jenkins, Mark. Worlds to Explore. National Geographic. आई॰ऍस॰बी॰ऍन॰ 978-1-4262-0044-1.